…come on! Why am I cursed with these terrible songs in my head?! At any rate, we’re celebrating this week and not because of Christmas. I’m still not close to ready for that…shopping, baking, menu planning, cleaning, wrapping, etc. all still left to do. I guess procrastination got the better of me this year – that and work. Two more days to go this week and I’m home free! So what are we celebrating? A four-spoon dish? Yes, but we’ll get to that momentarily. Are we celebrating two new awards? Yes, but again, we’ll get to that. Our celebration is in fact nothing blog or holiday related. We’re celebrating something that’s been in the making for 16 years…31 seasons…314 games and 117 penalty minutes (for Mike that is). 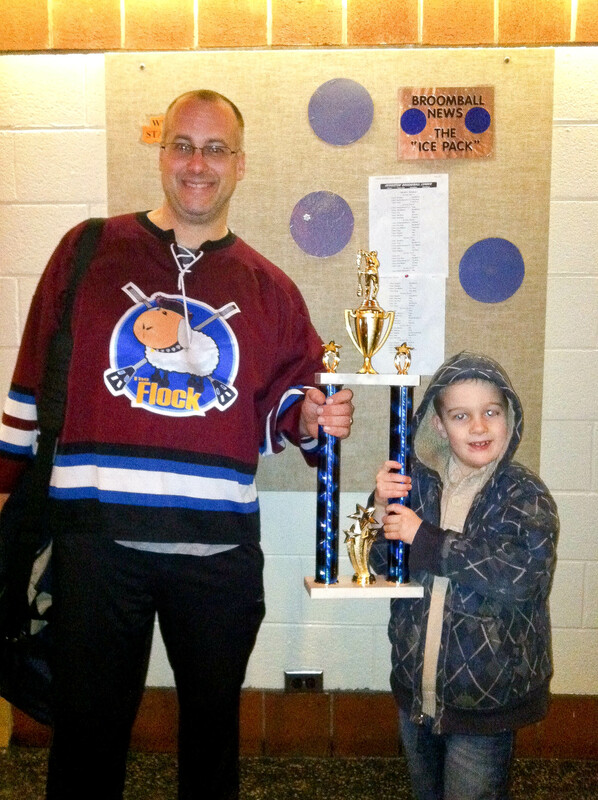 The Flock, Mike’s broomball team for more than a decade, clinched the Evanston Broomball League finals. And yes, it was worth the wait. Mike and I were just dating when I experienced my first broomball game. In fact, I don’t think anyone on his team was married. But last night as they took the title, eight pairs of little feet (a pair of which are brand new!) got to join their daddies on the ice. How time flies. Congratulations guys! So in honor of our champion and because we’re always on the look-out for a great weekend breakfast recipe, we bring you Maple Bacon Biscuits. Yes, they are as good as they sound. We’ll be making these on Christmas morning and the next time we have overnight guests. 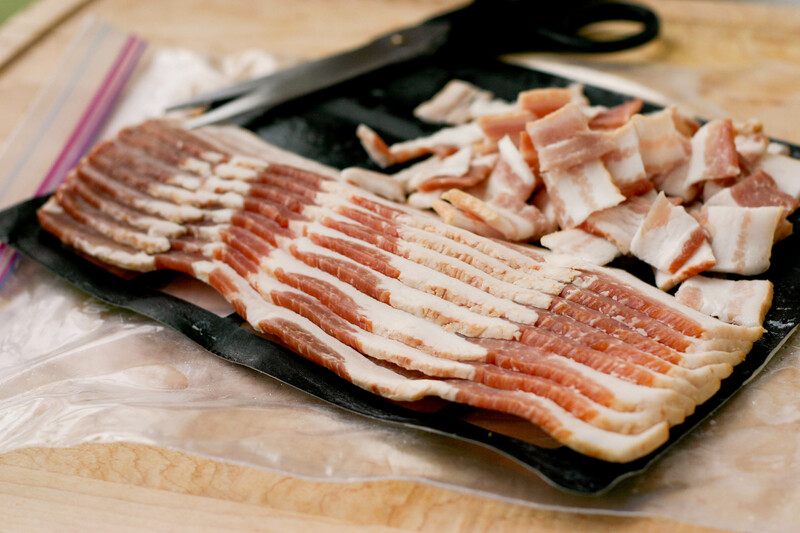 We started by chopping up some bacon into bite size pieces. 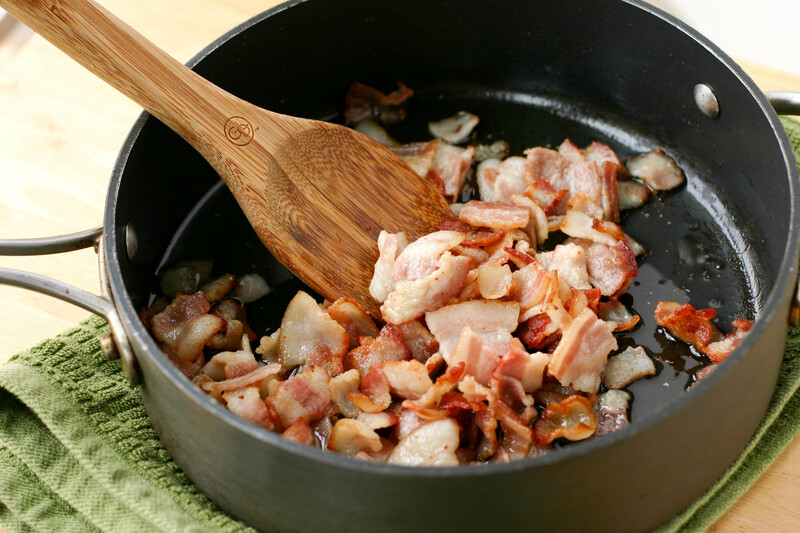 We cooked the bacon in a skillet until it was lightly crisped. Then we gathered our syrup ingredients including brown sugar, maple syrup, melted butter and flour. We combined everything into the skillet and stirred to coat. 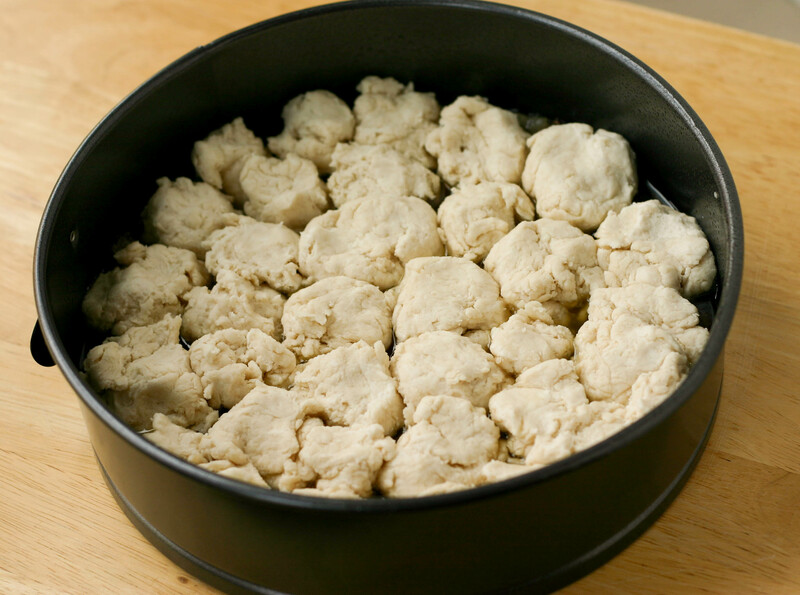 We then poured the maple bacon syrup into a greased 9″ springform pan and turned to our biscuit topping. We went back to a recipe we came across in one of our stateside adventures for Mississippi Buttermilk Biscuits and whipped up the dough. We then scooped the dough out over the maple bacon syrup in the springform. 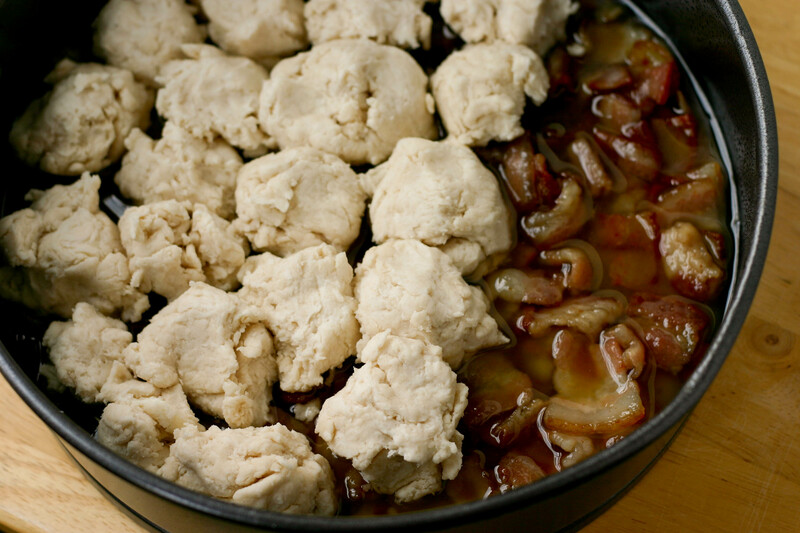 Once the biscuits covered the bacon, we baked the dish at 475F for 10 minutes. Then we turned the oven off and let the biscuits sit in the oven for another 5 to 10 minutes until they were golden brown. Next we removed the pan from the oven and flipped it upside down on a serving plate. We then released the pan and scrapped the remaining syrup over the biscuits. A little lick of the fingers and we knew this was going to be a big hit. 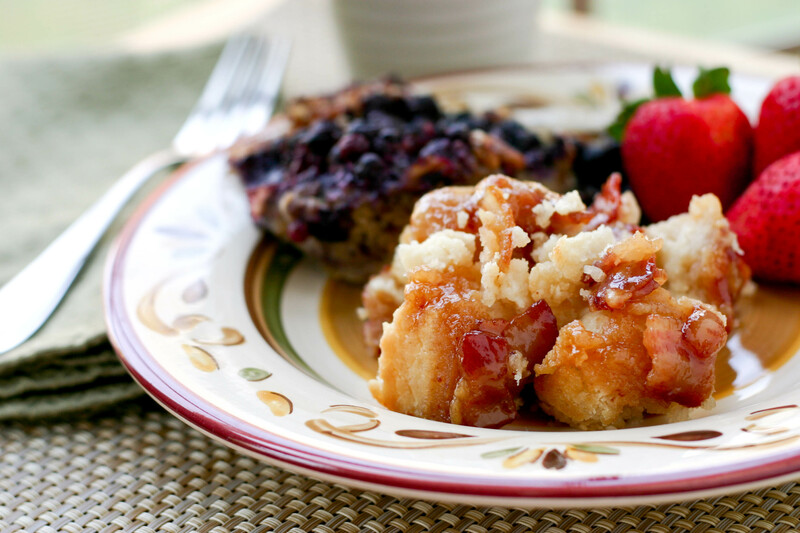 We served our maple bacon biscuits alongside a baked blueberry French toast and some strawberries. Mike’s parents (a.k.a. Nana and Papa) were on hand to join us in the taste testing. All I have to say is that the blueberry stuffed French toast didn’t stand a chance. While it was pretty good by French toast standards (albeit not our favorite), it just didn’t stand a chance against the warm, dripping, maple bacon goodness. Everyone ate their serving of the French toast, but everyone devoured the maple bacon biscuits – their own serving and then some. This was a definite hit. Even Mr. N and Miss A enthusiastically gave these biscuits 4 spoons (as did Nana and Papa! ), and we didn’t find anything hidden under anyone’s seats. 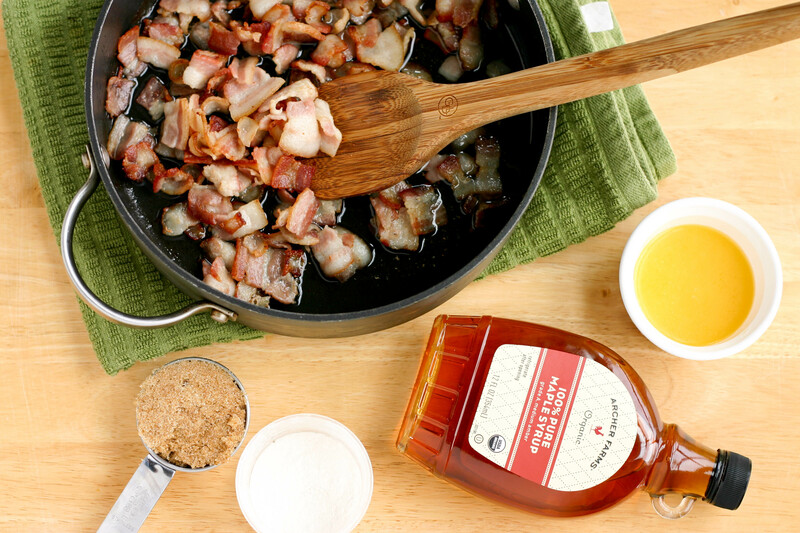 So if you’re looking for an easy, but downright delicious breakfast for friends, family or yourselves this holiday weekend (or anytime really)…what could be better than this breakfast of maple bacon-y goodness? Now on to the awards. Yesterday we were awarded the Liebster Award from the Orange Bee and the Versatile Blogger Award from Alternative Eating. Thank you ladies for honoring us with these awards. We are very grateful and ever humble. It means a great deal to us. We compiled our lists for the Versatile Blogger back in September and you can view them here here. Again, thank you Orange Bee and Alternative Eating. You made our day! Thanks for stopping by and commenting. I hope that you enjoy the recipe. 🙂 I know it’s one of our favorites. Pingback: Maple Bacon Biscuits | ~Dixie Chik Cooks~ Maple Bacon Biscuits | A Southern Belle who thinks about what's for dinner while eating lunch. 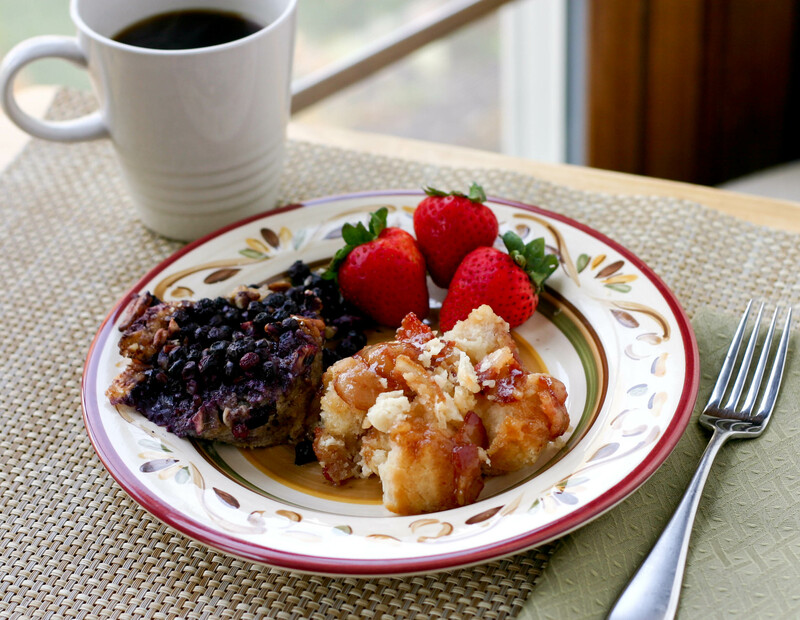 I made this on Christmas Eve for our breakfast – my family was absolutely swooning – it was that good! Is it bad that this is the first time I’ve heard of Broomball? 🙂 And oh, my goodness. This is a MUST make! We have a running joke with another family that every meal we cook for them has to have bacon in it — so I’m going to have to share this recipe with them. As for my family, I think they will go mad for this. My oldest ponytail LOVES bacon and so I put it in vegetables (like brussel sprouts) to try to get her to try them. This dish will require no coaxing and I am going to try it out for sure. Thanks for sharing this one!!! These look awesome! how much butter and syrup and stuff do you put in the skillet at the beginning? Congratulations to Mike – and OMG these look amazing!!!! They are a BIG hit! 🙂 Happy holidays Dawn! This would be ANYONE’S dream breakfast. Oh my. So bacony, and flaky and wonderful. I have never seen this before either! Ditto on all of the above, isn’t it just the best to start as a girlfriend/wife.. then have babies at the rink.. and then top it all off with kids on the ice with their dads! We went through the same stages with hockey and guess what comes next.. hilarious events where the kids are grown and outshine their dads with a gleam in their eye! This recipe is one of those ones where I say “oh… my… g#$…” as I scroll down the page (I’m sorry for swearing, but it just came out..) This is just over the top delicious sounding and I just know my husband and son would be crazy for it! You have the best ideas! Kristy is not kidding, this was the best breakfast ever!!!!! Solid 4 spoons from Nana and Papa. Yummo!!!! Thanks for sharing with us. Congratulations on the win. The biscuits sound fabulous! Thanks! 🙂 It’s been a good week so far. Congratulations to Mike and his team – awesome! 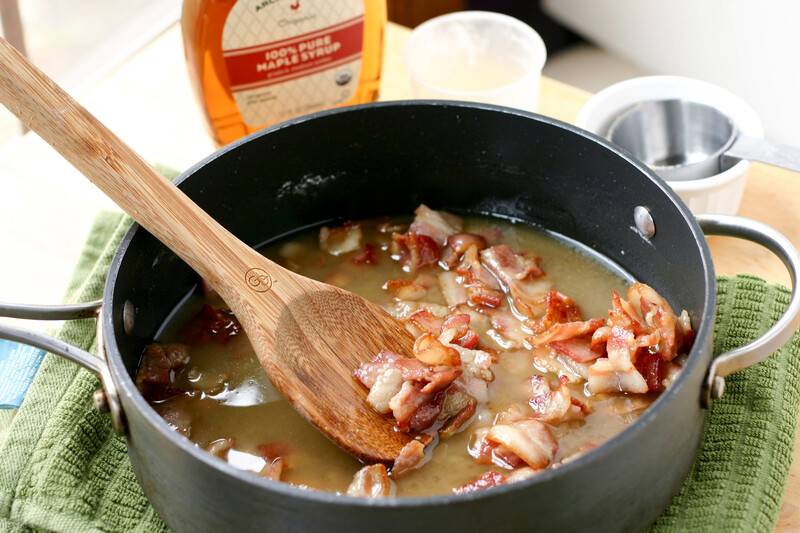 What a wonderful way to celebrate – bacon – maple syrup – a double win! LOL – you wouldn’t have embarrassed yourself in the least. You should have heard/seen the kids banging on the glass and screaming. They were a hoot. 🙂 And I have no doubt you’d love this recipe Kay – it’s a definite keeper. You guys have so much going on! Congratulations Mike, that’s awesome! Also congrats on the awards! Maybe you all should go play the lottery next! Okay, this dish looks dangerous but I love it! Omg, my boys would totally love this for breakfast. I am going to bookmark it for when we have something to cel-e-brate! You aren’t kidding Lisa! Fortunately I’m starting to feel like I can make heads and tails of things again. 😉 And I’d certainly take a lottery win! Then I’d go rent one of those places Kay is always posting and fly out all of our favorite blogging friends for a big party. Wouldn’t that be fun! Congratulations on the awards!! What a feast the maple bacon biscuit looks like cinnamon buns with pecans but sounds fantastic!!! Thanks Malli! Cinnamon and pecans sound downright fantastic too! Now you have really done it. 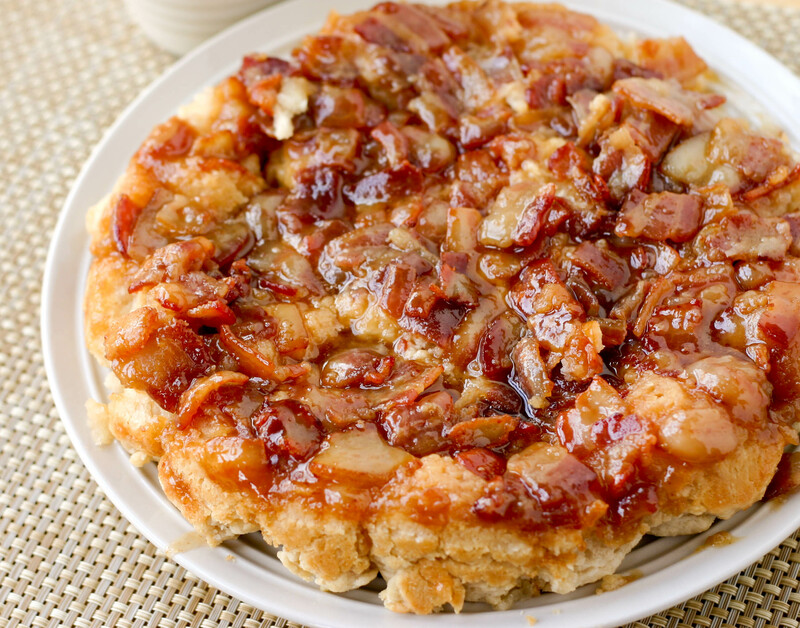 How is anyone going to be able to eat a normal breakfast when they will be thinking about bacon syrup biscuits while humming cel-e-brate good times. That is a royal breakfast if I have ever seen one! Holy DECADENT batman! That is one heart attack waiting to happen ;-). Not that I won’t try it, but Kristy, what a killer side (no pun intended!). I know JT would LOVE it and I have home made maple syrup to make it with too! Looks like a good Christmas morning breakfast, with a poached egg. Congratulations to Mike, he must be on top of the world! “Holy decadent batman!” just absolutely cracked me up Eva! I could just hear it. 🙂 I like the idea of poached egg with this too. Good combination! Holy cow. 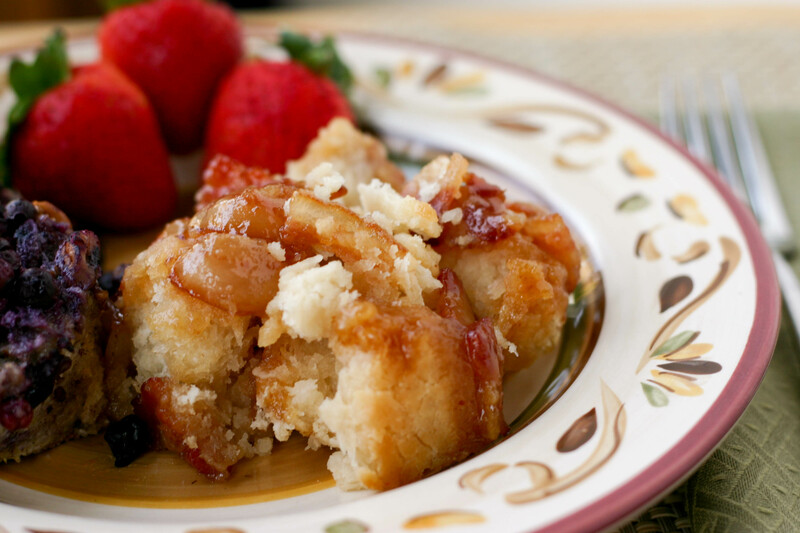 It’s like sticky buns, but 1,000 times better. I mean bacon and biscuits in one pan. I’m over the moon. Congrats to Mike too. He’s still beaming. 🙂 And yeah, I’d take these over sticky buns and that’s saying something. Christmas morning breakfast, check! Congrats to Mike and his team – how fun they’ve been doing it for so many years. 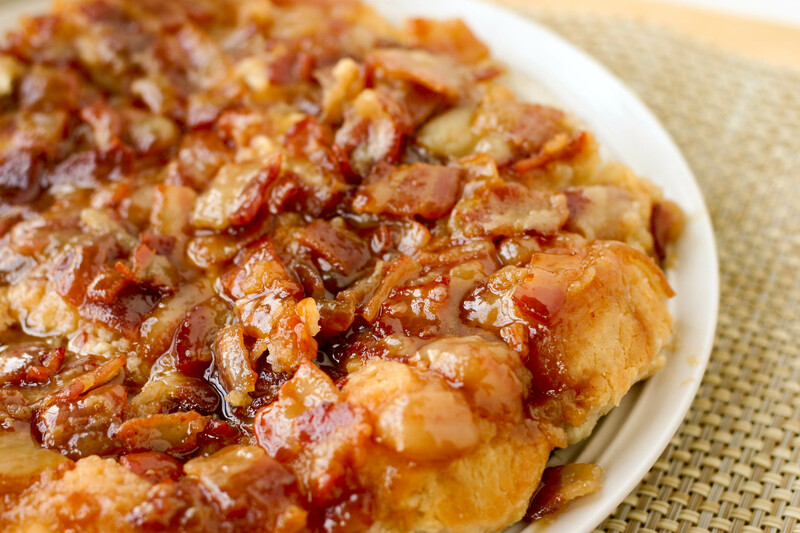 And what a way to celebrate – maple and bacon, a match made in heaven. No way….bacon and biscuits! OMG that is certainly reserved only for celebrations!! Congrats to Mike – how exciting! Maple bacon biscuits? Blueberry French toast? Kool & the Gang? What, are you trying to kill us? 🙂 Congratulations Mike!! 117 minutes in the box, eh?? Sometimes you got take a few for the team 😉 Enjoy the ‘sweet’ victory and Cel-e-brate Good Times (Lord help us with that one in our heads today – ;0) Gorgeous breakfast Kristy!! p.s. Christmas came early this morning – it’s a SNOW day here!! No School for the boys… Weee!! LOL – his teammates think he’s mellowed out since he had kids. 😉 Less time in the box the last several years. LOL. Yay for the snow! We’re still green here…maybe later today, but I’m thinking we’re green this year. I hope it was a great snow day! I do love those. What a great day! Congratulations to ChefDad, hooking penalty and all, for winning it all and bringing home the trophy! And what better way to celebrate than with biscuits, bacon, and maple syrup! Oh, my goodness! Poor French toast. With or without blueberries, it just didn’t stand a chance against so formidable a taste sensation! It’s funny because I was so excited about the blueberry French toast. I had been saving the recipe for weeks and was so pumped. I made the mistake of eating the biscuits first though and you’re right the French toast at that point didn’t stand a chance. I may revisit that recipe again someday – without the bacon biscuits on the side. And yes, for those who are curious, I did pick up two minutes for hooking in the final…the rest of the Flock picked me up though and killed off the penalty. Holy cow! Bacon, maple syrup and biscuits! How cool is that?! Congrats on the hockey and award wins. Well done!